Discovered by a British Army officer in 1919, the Ajanta and Ellora Caves in Aurangabad are stunning examples of India’s cave architecture. The bend on the cemented pathway in no way prepared me for what lay ahead. Just beyond the curve was a staggering sepia-hued horseshoe-shaped cave complex, The Ajanta Caves, chiseled in the rock face by many a deft and devoted hand. The magnificent Buddhist Caves remained hidden for centuries in the folds of the hills, till an intrepid British Army Officer John Smith stumbled over them. That was way back in April, 1819, and my pilgrimage was centuries after, in the sweltering heat of late spring. In 1983 they have designated a UNESCO World Heritage site and protected under the Archaeological Survey of India. Perched high on a cliff overlooking a gorge with the crumbly riverbed of the dry Waghora River lie the 30 caves. This landscape undergoes an emerald transformation once the monsoons waft into the region as swollen waterfalls cascade through the region and a lush green carpet is formed. The Ajanta Caves were painstakingly etched out of the rock face over 600 years, some with ante-chambers gouged out along with main rooms. Royal artisans embellished their craft in the dimly lit cave environ using nothing more than the available light and the clever use of white fabrics as reflectors to illuminate the caves while at work, resulting in each being more wondrous than the other. The caves comprise Chaityas (halls of worship) for prayer and Viharas (monasteries) where Buddhist monks lived and delivered discourse. Life-size and larger than life stucco-enriched sculptures of Buddha adorn the walls as weel as intricately painted narratives form the Jataka Tales using vegetable colors that are still luminescent after the passage of time. Voluptuous women, agile deer, vibrant peacocks, and the enduring lotus are recurring motifs throughout the caves. Despite the oppressive heat, the crowds surged. A group of Japanese and Korean tourists were our companions in our journey of discovery of a lot civilization. The experience was pleasurable. Air-conditioned buses, for a fee of course, ferried passengers from the pick-up point, a good mile away from the caves. The drop-off point had a restaurant with rest rooms. Soon, we began the treacherous climb up the slope. There is an option of being carried up in chair palanquins by bearers right to the mouth of the caves, footwear, wisely, is disallowed in the caves, and is left neatly outside the cave on tracks or stacked on the side. The caves were illuminated with modern-day fibre optic lights, which do not damage the delicate artwork. As we left the caves, a tiny bronzed plaque caught our eyes, perhaps the only acceptable graffiti on this complex, signed, John Smith. A couple of miles away are the Ellora Caves, a telling example of the secular fabric of ancient India. 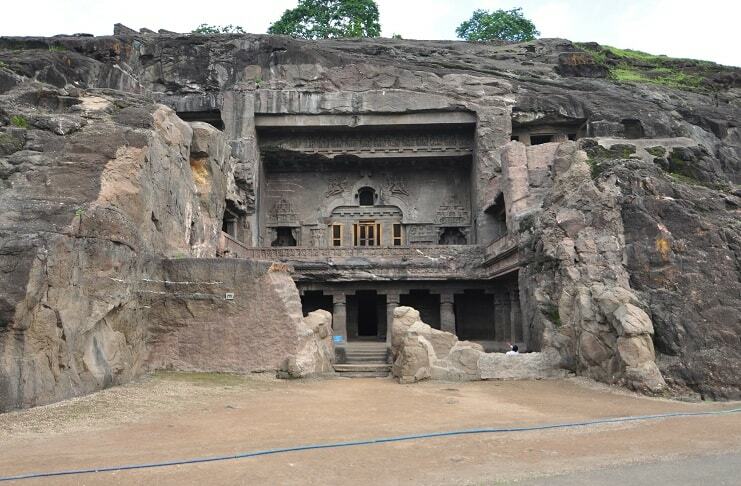 This unique 34-cave temple and monastery complex dates from A.D. 600 to 1000. It has sanctum sanctorums devoted to Buddhism, Hinduism and Jainism with Buddhist Chaityas, Viharas and Hindu and Jain temples. The soothing effect of the environ still lingers through this humongous complex that is connected by stairways and slop ways. Each monument is more stunning than the other, but the most awe-inspiring one is the magnificent Kailas Temple – the largest monolithic structure in the world – which has been studied for years, yet whose secret has never been unravelled. It’s a befitting tribute to Mount Kailash and the mighty god, Shiva. Every nook and crevice has its own story to tell, be it the pictorial depictions of the epics Ramayana and Mahabharata or the imposing lingam that occupies centre stage. Over the years, this World Heritage monument has been a source of spiritual solace to many devotees and continues to be a famous pilgrimage site even today.